A few weeks back news broke that a portion of the derivatives unit at JP Morgan had made a major mistake on a trade that essentially blew up in their face. The trade (so far based on what we know) has cost JP Morgan $2 billion in losses. Jamie Dimon, the CEO of the bank, was forced to hold an emergency conference call after hours with investors to discuss the losses. 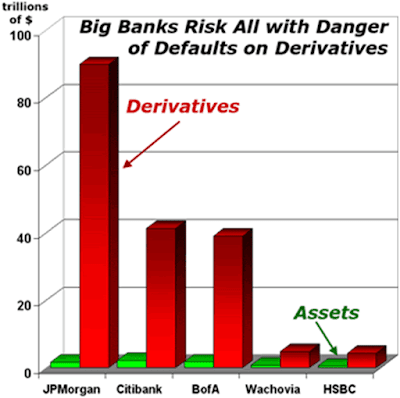 Derivatives have been famously called by Warren Buffett weapons of mass destruction. Their size has grown so enormous in the financial market that no political leader even dares mention the topic of their regulation. The derivatives market can be thought of as an enormous atomic bomb resting in the ocean with the power to blow up the entire planet. Think that is an exaggeration? The following chart shows the size of the derivatives market (red line) compared to other major asset classes around the world. The spec next to the red line in green is the entire global annual GDP. The yellow line is the sum total value of the entire global stock market. Estimates show that the derivatives market is now somewhere between 700 trillion and 1 quadrillion dollars in size. It grows rapidly every year, like a contagious plague spreading through the financial system. 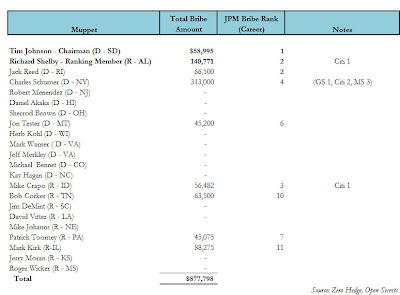 JP Morgan is by far the largest participant in the derivatives market. They are approaching close to $100 trillion in derivatives just on their own. The following chart shows their total holdings (red line) next to the assets they have backing potential losses (light green line next to it). Why does this matter? If anything should happen to these precious banks or their balance sheet we now know that the government (taxpayers) stand behind them 100%. They have become wards of the state who collect endless millions in bonus payouts when derivatives contracts go well and turn to the Federal Reserve and tax payers when they go bad. This week the Senate banking committee held a hearing where they wished to investigate this derivatives "thing" they have heard about on the news. Who has paid for the Senators to receive their seat on the senate? 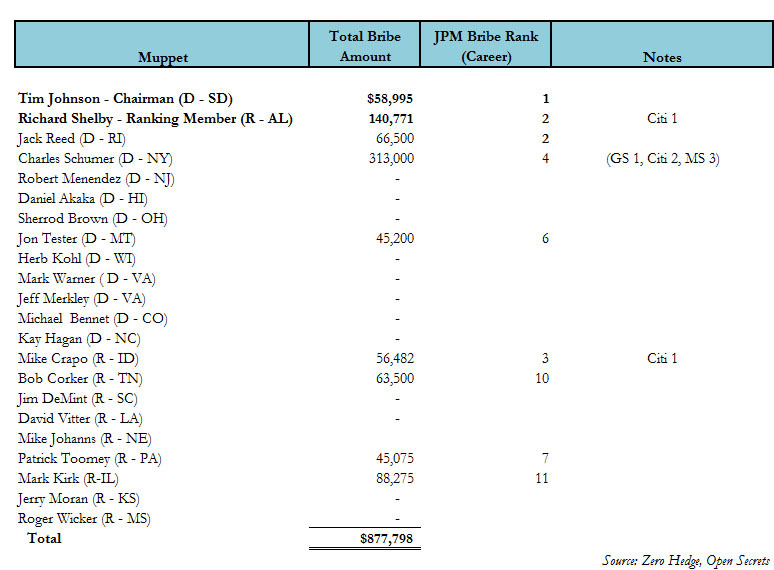 The following chart put together from Zero Hedge shows that this committee has received $877,798 in campaign contributions from JP Morgan. Who is the number one campaign contributor for the man in charge of the committee, the chairman Tim Johnson? The testimony of course immediately turned into a clown show where the committee members groveled at Dimon's feet and asked him how they should regulate JP Morgan in the future. The following clip from the Daily Show sums it up perfectly. All eyes of the world will once again be on tiny Greece over the weekend. They are holding a major election on Sunday that will determine a great deal of their future and the global economy. Over the past 30 days the Syriza party has stormed the polls and is now neck in neck with the New Democracy party heading into the weekend. What does Syriza promise? An end to the current bailout imprisonment structure in place with Greece and the Eurozone. They promise to rip up any current agreements and move Greece back into the freedom of the Drachma currency. If I lived in Greece I would vote for the Syriza party. Would things be better right away for the country? No, it would be much, much worse. The country would enter a massive depression that is far greater than anything they have experienced up to this point. Weak banks would fail, capital would flee the country, unemployment would rise significantly, and the cost of living would surge. It would most likely take 18 months for the country to reach bottom. And then, they would reach bottom. After defaulting on their debts and cleansing their toxic banking system, with a new budget in place the drachma currency would find a bottom. At this point investment capital would begin moving back into Greece. Smart business owners would set up factories inside Greece's borders and export goods out to the rest of the world through the drachma currency. Intelligent real estate investors would purchase assets at steep discounts through a discounted currency. The stock market, after collapsing, would look very attractive. The alternative is to suffer a much slower and painful death over ten to twenty years where there is never a bottom and there is never a recovery. The leaders of Europe and the heads of the banks have done everything they can to proclaim that "the world will end" should Greece leave the Eurozone. One thing is for sure: their world would end. A politician's only goal is to push back immediate trouble through the next election with additional debt and money printing. A banker's goal is to get through the next quarter and bonus period before things turn down. Any downturn would lead to a politician losing their job and a bank CEO being let go by their board. People vote based on what is happening now. They do not care if a politician is doing the right thing for their country in the long term because the average voter understands very little about economics and finance. Ironically, based on their immediate pain this has given Greece the opportunity to do the right thing, with the people not understanding it will only bring even greater immediate pain. I am excited for Greece to at least have the opportunity to do the right thing, even if the Syriza party loses over the weekend. In America we have a president who promised hope and change, but only brought the same policies (stimulus and money printing with an economy smothered by the current banking system) as his predecessor. Obama, however, has taken the failed Bush blueprint and applied steroids to it. Our elections in the fall have him pitted against Mitt Romney who will endorse the same exact Bush/Obama policies after his election. We know this because we can view his top campaign contributors, which looks like a top ten list of the largest banks in the country. Greece leaving the Eurozone would provide the next "Lehman" moment. There would be massive strain in the financial system and stock markets followed by an earth shattering response from central banks around the world (money printing). The basic investment strategy would be to have capital ready to invest before the sell off and be ready to pull the trigger on specific assets when panic engulfs the markets. The world could be a very different place on Monday morning. Is this the beginning of the final wash out? We will have to track the data moving forward to see. 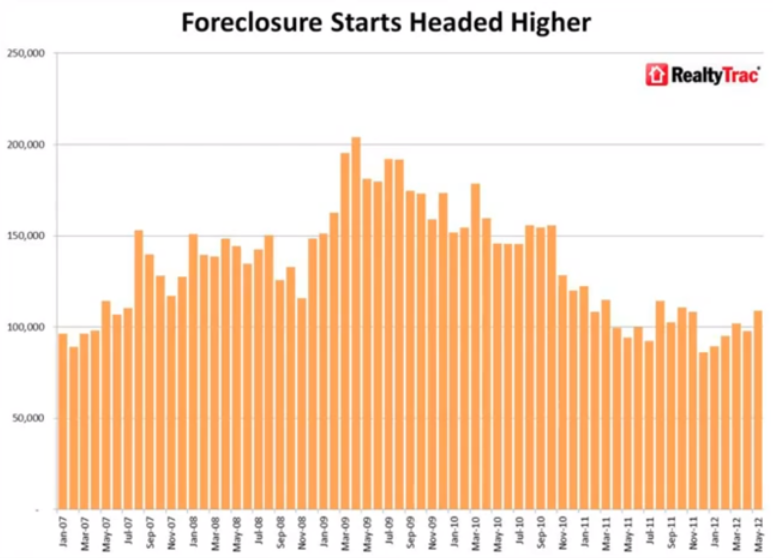 The banks have held a massive amount of inventory off the market for close to two years, and it will need to be flushed through the system before the United States can find the true bottom in home prices. The final move down will once again surprise those that have turned bullish. It will also create a mood of maximum pessimism in the market where quotes such as "home prices will always fall" and it is "always better to rent" will become common place among dinner parties and water coolers. This will be one of the best times to purchase real estate for this generation. Stay patient. I will continue to track the foreclosure reports monthly here. 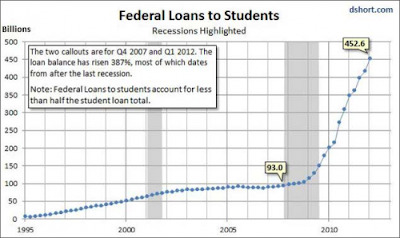 Will The Coming Student Loan Crisis Be Worse Than Subprime Mortgages? 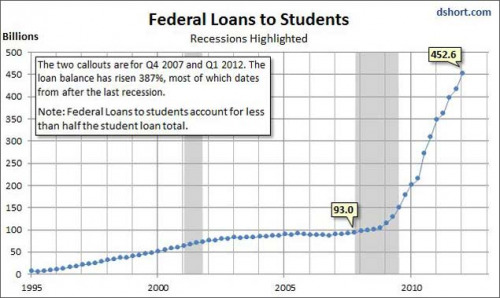 The following graph shows the growth of federal (taxpayer funded) loans to students from 1995 through today. As you can see the chart has now become parabolic, similar to a subprime housing graph from 6 years ago. 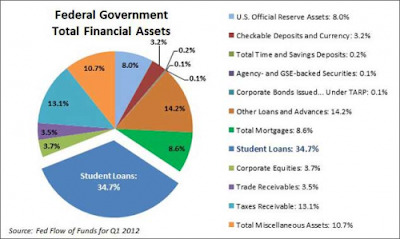 Student loans have now become the largest asset the federal government owns. The blue piece in the pie graph below shows that student loans now compose 34.7% of the total through the first quarter of 2012. It is commons sense that the student loan crisis will be a complete disaster, but will it be worse than the subprime housing crisis? Professor Antony Davies of George Mason University argues why he believes it will. For a more in depth discussion on student loans, sovereign debt, and asset price direction in the months ahead see 2012 Second Half Outlook. Questions continue to emerge regarding how the most recent Spanish bank bailout of $125 billion will be funded. The current structure of the EFSF fund (the large bailout fund pooled from all Eurozone members) has Spain contributing 12.75% and Italy contributing 19.18%. Spain contributing to its own bailout should need no further discussion. Italy's contribution is almost as ridiculous. Italy, just like Spain, Greece, Portugal, and Ireland are currently insolvent and can only continue to function through additional bond sales and/or bailouts. It currently costs Italy somewhere between 4 - 7% to borrow money in the bond market. The current loans to Spain of $125 billion are set at 3%. Italy must sell bonds (the country has no money) at 6% and then re-lend that money to Spain at 3%. Again, as with Spain borrowing money to contribute to its own bailout fund, the stupidity involved in the Italian loan could be understood by a 3rd grader. Italy has a government debt to GDP ratio of 125%, well worse than Spain's current 70% mark. However, Italy's banking system is not quite as bad as Spain's at the moment. In the world we live in today, governments and banks within that country are now counted as one entity because it is immediately assumed that no politician in the world will have the courage to let a bank fail (the same banks that paid for their election through campaign contributions). Every day, all the PIIGS countries continue to deteriorate under the surface. It will not be long before Greece once again runs out of cash, and if Italian rates continue to rise at the current pace Italy will need a bailout in a matter of weeks. The world will soon see what happens when the political solution to a debt problem is additional debt. Unfortunately, it appears that every PIIGS country may face the reckoning day at the same moment. Nigel Farage has much more on this topic in the video below, as he provides another lesson on common sense to the politicians of Europe. Chris Whalen, arguably the best bank analyst in the world, spoke with CNBC this week on JP Morgan & Jamie Dimon. Whalen is curious if Dimon will tell the whole truth during his testimony today because "he has not done that yet." The sell off in Spanish and Italian government bonds has been relentless throughout the week. 10 year Spanish bonds hit new all time euro era lows today at 6.83% (rising rates means falling prices). Italian 10 year bonds have soared up to 6.3%. The bailout for Spanish banks announced over the weekend was designed to bring calmness back into the market. It has done the exact opposite. Why? What subordination means is that the creditors providing the bailout to Spain have asked to be paid out first in the future if Spain were to default. Imagine you lend your friend Michael, who has run into some tough times financially, $100 per month to help him out temporarily with his bills. Michael decides that he needs even more money and asks the local unemployment office for an additional loan. The unemployment office agrees to provide him a loan under one condition: When he pays his debts back in the future the loan to the unemployment office must be paid in full before any other lenders can collect any money. Under this scenario you would obviously be pretty upset at your friend for agreeing to such a deal. Michael stops by your house the first of next month to pick up his regular $100 friendship loan. Unfortunately, this time you decide not to come to the door or return his calls. This is exactly what happened this week when Spain went back to the bond market to ask for more money. The bond market is turning its back on Spain because investors do not want to be left in the wind should Spain default (under a normal scenario all lenders would be treated equally). Let's say your friend Michael has borrowed $500 from you. He received an additional $500 from the unemployment office. In the future he may have to "default" on his debt and tell you both that he can only pay back $200. You would each collect $100 of Michael's pay out (splitting the $200). With subordination in place the unemployment office now collects the full $200. They are first in line. Spain is now following the exact path Greece moved through. Italy, Portugal, and Ireland are not too far behind and could easily jump ahead in the crisis at any moment. Look for these other PIIGS to begin a renegotiation process on their bailouts after watching Spain's recent sweetheart deal. Spain was asked to take no additional pain through austerity, something that was demanded for all the previous bailouts up to this point. Ireland in particular is in almost the same exact situation (a real estate crash has created a banking crisis). Will the current band aid be enough? Spain's government has admitted another potential 35% downside risk to home prices. Their government debt to GDP, which is officially around 70%, is actually closer to 150% when factoring in regional debt, bank aid, obligations to the EU/ECB, and the most recent bailout. Their banking system, regional debts, and government debts have become one merged mountain of toxic subprime ready for implosion. Keep your popcorn ready and your computer monitor tracking the 10 year bonds. I'll be with you every step of the way as we move through this massacre. 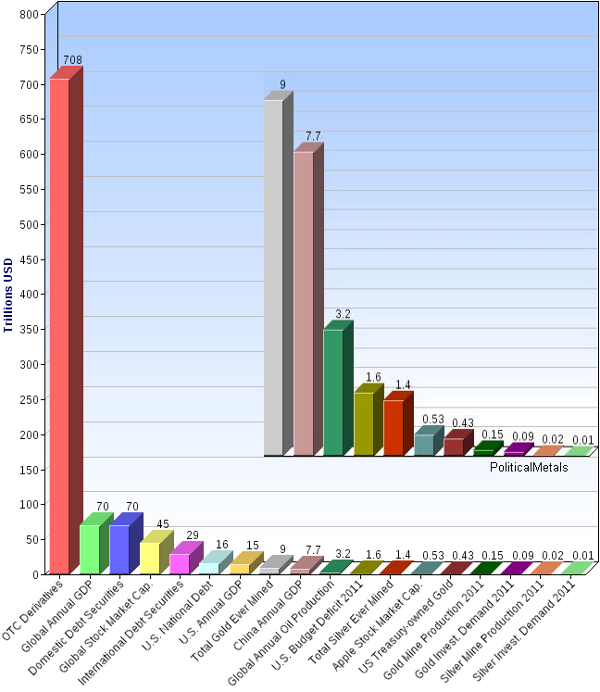 For more on the bailout details see The Spanish Bank Bailout: A Larger Mountain Of Toxic Debt. Are Low Interest Rates Good? Over the weekend we have received news that the Spanish government has requested, and received confirmation that they will receive, a $125 billion bailout for their banks (100 billion euros). This amount of money may seem small based on the "trillions" that have been recently handed out by central banks through the printing press, but it is an enormous number based on the size of the Spanish economy. To put it in perspective, an equivalent bailout in relation to the economy size of the United States would be $1.6 trillion. This new Spanish banking bailout puts the 2008 TARP program in the US to shame. We have discussed numerous times why a bailout of this size would be needed. The Spanish banks took on an enormous mountain of toxic real estate loans that were merged with a mountain of toxic Spanish (and other European) government bonds. As the value of the assets on their balance sheets moved into free fall, their underlying capital base was in the process of a modern day bank run as depositors continued to flee week after week. The entities used for this bailout will be the ESM and the EFSF bailout funds (remember them?) created during the peak of the stress in the market last fall. The ESM has not been fully approved for use by Germany so a discussion on using that fund is premature at this point. The problem I discussed with the EFSF when it was created is that the bailout money funding the piggy bank (which at the time was created for Greece) would be coming from the countries who would also eventually also need bailouts. Today that day has arrived. The EFSF has close to 200 billion euros in available capital, but 93 billion of that money is coming from Spain. As the crisis deepens and Italian, Greek, Portuguese, and eventually French banks need a similar bailout; who is going to fund the fund? Just as with every bailout for Greece, they are providing additional debt to a Spanish banking system which is already insolvent. This allows them to keep their doors open for a few months longer but makes the losses much greater in the long run. Imagine there is a guy who lives on your street named Tom. Tom has $200,000 in credit card debt, and he has lost his job. The credit card company, which does not want to take losses on the $200,000 in debt they have already lent Tom, decides to provide him with another $100,000 in capital. Tom will now have $300,000 in total debt, but with the fresh $100,000 in capital he can continue to make the interest payments. Tom, from the example above, does not care if he declares bankruptcy with $300,000 vs. $200,000. In fact, any rational person knows that if you are about to declare bankruptcy you should borrow as much money as possible for as long as possible. With this $100,000 Tom can go on a two year vacation before starting his life over with his debt cleansed. The bank understands that the $300,000 will never be paid back, but by lending the additional money and keeping payments current it allows them to mark the total $300,00 as an asset on their balance sheet with full value. This allows both management and corporate employee bonuses to be paid out for two more years while Tom is vacationing. Everyone wins. The lenders of the recent bailout money to Spain and Greece understand that the money will never be paid back. The walls are closing in quickly around them and they are doing everything possible to push back the day of reckoning just a little bit longer. Most likely a large portion of this $100 billion given to Spanish banks will be used to purchase Spanish government bonds. Estimates are that the interest rate charged on this most recent bailout will be around 3%. With Spanish government debt at over 6% the banks can purchase the debt and pocket the 3% spread. They understand that the Spanish debt will collapse in price, but they are now working together with the government to create one enormous Too Big Too Fail economy/banking system. What does this bailout mean for the markets in the short term? Most likely a massive rally in the euro currency, which had record short positions placed against it heading into the weekend (creating an enormous short squeeze opportunity). The financial stocks and stock markets will most likely love the news and rally. The risk off trade (currently treasury bonds) will sell off. What does this mean for markets in the long term? Nothing. Stay the course discussed in detail last weekend in 2012 Second Half Outlook. For more on what led to this banking bailout see Modern Day Bank Run In Europe. Gary Shilling discusses the incredible recent run in US treasury bonds and why he feels it is still the best place to put new capital today (I disagree). He also discusses the housing market and why it has more to fall (I agree).